Elvin. Front: John, Henry, Cora (Biege), Sophia, Perez. Alexander, Richard, 25-1991M [R37CM], GAR member, Co. K, 45th Wis. Inf. Apker, Samuel R., 42-1988AC (R37-AC), Civil War soldier, 17th Wis. Vol. Inf. Co. H.
Apker, Samuel R., 42-1988AK (R37-AK), Civil War soldier, 17th Wis. Vol. Inf. Co. H.
Apker, Samuel R., 14-1914 (911), Civil War soldier, 17th Wis. Vol. Inf. Co. H.
Babcock Fox. Home near Delton. Backhofen, Bertha, & Adolph Stebler, UN994. See note on Adolph Stebler. Barbeau, Pierce Boisdore, UN394, b. LaPrairie, Canada, June 29, 1800. d. Sault St. Marie, MI, Oct. 17, 1882. Barbknecht, Arthur H., 7-1963D (B3-33D), Soldier, 1944. 1st Ward; James S. Worthman, alderman 2nd Ward. Barrett, Estele, 20-1999G, married George Weber, seated 3rd on right row. School photo. Talbot, Ruth Cahoon, Grace Conklin, Clarence Bohn, Merl Talbot, Miss Booher (teacher). 2nd Row: Carrie Francois, Arta Risley, Marnenie Pool, Bess Bohn, Winefred Benneth, Bess Kirk, Alta Blackman, Hazel Cahoon. 3rd Row: Hattie McBrier, Edna Powers, Arma Cook, Amy Bohn, Ferne Cahoon, Eva Bohn, Mildred Enech. Bartley, Minnie, 7-1963O [B3-33O], c. 1906. Gladys Pearson-teacher at Man Mound School. Minnie Montgomery Bartley, William George Montgomery, Carrie Montgomery. Bartley, Mrs. R.N., 7-1963F (B3-33F), 1912 at Adams, WI. Also with Mrs. John Peterson. Baumgarth, Lorene, Verlin, 102-2006-6. C. 1936. Baumgarth, Lorene, 102-2006-5. Lorene Baumgarth Hoty. Beebe, Laura, 2-2002PN, 1885, in her wedding dress, taken in Toronto, Ont. Berkley, Harold, 2-2002OB, Fishermen, c. 1900. Also: John Martin, Will Springer, M. Brown. Blackman, John C., UN736, Quartermaster, 42nd Regiment Infantry, Civil War soldier. Blake, J.W., 42-1988AE (R37-AE), Civil War soldier, 42nd Wis. Vol. Inf. Blatchley, Anna,UN542, Mrs. Samuel McCoy, Born c. 1850, a teacher. Died c. 1919. Blackman, John C. 42-1988AH (R37-AH), Quartermaster, 42nd Regiment Infantry, Civil War soldier. Bliss, Bell, UN382, National President of the Women’s Relief Corps. Bliss, Bell W. UN378, National President of the Women’s Relief Corps. Bliss, Bell W. UN383, National President of the Women’s Relief Corps. Bliss, Bell W., UN379, National President of the Women’s Relief Corps. Bliss, Bell W., UN494, National President of the Women’s Relief Corps. Robinson Osborn, 11. Helen Riney, 12. Clare Mould Patrich, 13. Maud Roethinger-Mrs. Dr. Hoyt, 14. Mabel Woock Lawrence, 15. Margert Morris, 16. Elizabeth Ruggles Saunders, 17. Eva Christie, 18. Mary Ruggles, 19.Allie Secker Hofstatter, 20.Ida Palmer Ringling, 21.Mrs. Mould, 22.Norma Mould Acott. Emma Bohn, Nina Bohn Hall w/Norville, ?, Genivieve Bohn, Art Bohn, Jerry Bohn, Edith Miner, Bertha Bohn. 4th row: ?, ?, Otto Bohn, Hall Rathman, Amy Bohn, Henry Bohn, Dan Bohn, Harvey Bohn, ?, ?, ?, Clark Miner. 5th row (back): ?, ?, Bess Bohn, Olive Bohn, Eva Bohn, Nillie Bohn, Anna Nuss, Alta Bohn, Myrtle Bohn, Part Hall, Wolter Bible, Fred Kemps. Bohn, Winifred, 2-2004G, b. 1889; with 1st daughter, Virginia, b. 1908. photo c. 1912. Photo from Elaine Bohn Foster (daughter of Frank & Winifred Bohn), received Jan. 2004. (daughter of Frank & Winifred Bohn), received Jan. 2004. Bonfoy, Anna Helen, 2-2002QS, 1881, 22 years, class of 1884, Minnesota U.
Bradley, Mary E., UN497, Teacher in Rockford, IL before her marriage to Mr. Hill, c. 1860's. Brew, Wm, 2-2005N, William Brew, son Daniel, Emma (Rothe) Brew. Seated on lawn. Brown, M., 2-2002OB, Fishermen, c. 1900. Also: John Martin, Will Springer, Harold Berkley. Buchenan, Capt. Charles C., UN999, res: Sauk City; 9th Wisc. Inf. Co. D.
Kimball, 7. Louise Andrews Lawson, 8. Allie Barlow Tyler. Butterfield, H.N., 25-1991L [R37-CL], GAR member, Co. M 1st Wis. Heavy Art. Camp, Dan, 23-1986 [D14-I], watercolor painting of farm in Mukwanago, Waukesha Co.
Camphil, 2-2003BG, Mrs. Camphil & ? Canfield Log Cabin. In 1842. From “Historical Sketch of Baraboo” by Wm Canfield, 1891. Canfield Family. In 1842. From “Historical Sketch of Baraboo” by Wm Canfield, 1891. Canfield, Wm & Wife. In 1842. From “Historical Sketch of Baraboo” by Wm Canfield, 1891. Canfield, Wm H. Portrait 1836. Located at SCHS museum. Canfield, William H., UN1320, in front of his tree house. Chamberlain, UN1291, in front of the third ward school. Claude, 6-1989 [P31-B], cabin living room, at Devil’s Lk., Eagle Crag, built 1857 on North Shore. Claude, 7-1969A [E6-43BH], cabin at Devil’s Lk., Mar. 1940, Eagle Crag, built 1857 on North Shore. Claude, UN1336, cabin at Devil’s Lk., Eagle Crag, built 1857 on North Shore. Clifford, Mike, 2-2006ER, & wife, from Oaks, WI. Cole, H.E., 2-2002RY, c. 1906. Lewis family, L-R: Dwight Lewis, Mrs. C. Walsh, E. L.
Miss Carolyn Kimball, H.E. Cole, D.A. & Mrs. Lewis, Leona Lewis, Milton Lewis. Conklin, Grace, 14-1995I44, back: Edna Stoll, Rose Kohlmeyer, Maud Barrett, Celia Meyers, Ferl Talbot, Ruth Cahoon, Grace Conklin, Clarence Bohn, Merl Talbot, Miss Booher (teacher). 2nd Row: Carrie Francois, Arta Risley, Marnenie Pool, Bess Bohn, Winefred Benneth, Bess Kirk, Alta Blackman, Hazel Cahoon. 3rd Row: Hattie McBrier, Edna Powers, Arma Cook, Amy Bohn, Ferne Cahoon, Eva Bohn, Mildred Enech. Conway, UN713, Mrs. Conway, mother of Edith Ringling wife of Charles Ringling. Cook, Arma, 14-1995I44, back: Edna Stoll, Rose Kohlmeyer, Maud Barrett, Celia Meyers, Ferl Talbot, Ruth Cahoon, Grace Conklin, Clarence Bohn, Merl Talbot, Miss Booher (teacher). 2nd Row: Carrie Francois, Arta Risley, Marnenie Pool, Bess Bohn, Winefred Benneth, Bess Kirk, Alta Blackman, Hazel Cahoon. 3rd Row: Hattie McBrier, Edna Powers, Arma Cook, Amy Bohn, Ferne Cahoon, Eva Bohn, Mildred Enech. were 2 men with this name), Neg. Davis, Charles H., 25-1991CC [R37CC], GAR member, Co. F 3rd Wisc. Dennis, John, 7-1982 [K13-E], family home, town of Merrimac, 2 mi. N. of road to Devil’s Lk. Deppe, Ted R., UN359, 1944, 2nd Lieut. Devlin, 12-1985 [V-J7], L-R, Back: ?, Mame Odekirk, Phoebe Hannes, Hattie Norris. Center: Gertie Premo, Devlin, Mrs. Harve Peck (teacher), Develin, ?. Front: Lucy Smith,Esther Pigg, Charity Premo. Devlin, Mable, 91985 [V-7F], Alice Smith (Mrs. Arthur Farnsworth), Mae Devlin, Susan Smith (Mrs. George Loos), Mable Devlin, Phoebe Hains (Mrs. Jones), Lucy Smith (Mrs. Dexter Russell), Constance King (Mrs. Arthur Hill), Clara Haines. Devlin, Mae, 91985 [V-7F], Alice Smith (Mrs. Arthur Farnsworth), Mae Devlin, Susan Smith (Mrs. George Loos), Mable Devlin, Phoebe Hains (Mrs. Jones), Lucy Smith (Mrs. Dexter Russell), Constance King (Mrs. Arthur Hill), Clara Haines. d. 11 Mar. 1964. Boy seated-Walter A. Lehmann, b. 11 Nov. 1888, d. 30 Jun. 1976. Dithmar, Edward, UN357, Baraboo, Mar. 17, 1897, group, top far right. Drew, J.P., UN352, wife Eliza. Ann, had daughter, Ellen. Civil War photo? sick. Was 36 years old and born in Baraboo. Father: Carl Dyrud, Baraboo; Sisters: Mrs.
Dyrud, Portland Oregon & Carl Dyrud, Elroy, WI. School, taught in Adams Co. Graduated from Medical Dept. of Iowa State U. in 1885.
organized & conducted Reedsburg Hospital. Died Aug. 11, 1933. Buried Oxford, WI. Ferdinand. Both breweries were located on Lynn St., Baraboo. Effinger, Carl Ferdinand, 116-2002A, married June 16, 1937. “It was the union of 2 breweries. were located on Lynn St., Baraboo. Effinger, Fred, 13-1997B, c. 1934, has “Community” stein to taste beer, later stolen. Emery, Hazel, UN961, front row middle. Group of ladies. Emery, Hazel, UN962, front row 5th from left. Group of ladies. Enech, Mildred, 14-1995I44, back: Edna Stoll, Rose Kohlmeyer, Maud Barrett, Celia Meyers, Ferl Talbot, Ruth Cahoon, Grace Conklin, Clarence Bohn, Merl Talbot, Miss Booher (teacher). 2nd Row: Carrie Francois, Arta Risley, Marnenie Pool, Bess Bohn, Winefred Benneth, Bess Kirk, Alta Blackman, Hazel Cahoon. 3rd Row: Hattie McBrier, Edna Powers, Arma Cook, Amy Bohn, Ferne Cahoon, Eva Bohn, Mildred Enech. English, Jennie Wright, 2-2002QH, 1859, the great, great, great, great granddaughter of Wm. L-R: Cass, Lester, Grant N., Uncle Fred, Eleanor Denmore, Aunt Katie, Maud, Mrs.
Erffmeyer, Annie, 25-1942 [D6-1], second wife of C.J.H. Erffmeyer. Evans, R.D., 2-2006EQ, attorney in Baraboo. Francois, Carrie, 14-1995I44, back: Edna Stoll, Rose Kohlmeyer, Maud Barrett, Celia Meyers, Ferl Talbot, Ruth Cahoon, Grace Conklin, Clarence Bohn, Merl Talbot, Miss Booher (teacher). 2nd Row: Carrie Francois, Arta Risley, Marnenie Pool, Bess Bohn, Winefred Benneth, Bess Kirk, Alta Blackman, Hazel Cahoon. 3rd Row: Hattie McBrier, Edna Powers, Arma Cook, Amy Bohn, Ferne Cahoon, Eva Bohn, Mildred Enech. Farnsworth, Dr. A.L., UN365, House at 318 Remington, Baraboo after 1922 ice storm. Farnsworth, Dr. A.L., 17-1993H8 [C39-H8], House at 318 Remington, Baraboo after 1922 ice storm. Farnsworth, J.R., 25-1991B [R37CB], GAR member, Co. D, 46 Wis. Inf. Fisher, A.J., UN435, home in Benton Harbor, MI, 452 Maple St.
Fisher, Amanda?, 16-2001EX, Mabel Woock & Amanda Fisher? Foley, Martin, UN496, 1905, with daughters, apple raising. Folz, Olive, 2-2002NN, Former waitress at Warren Hotel, with a man. Fowler, Julia, UN404, daughter of Daniel Fowler who later married Mr. Brown. French, John, 112-2006K, John Edwards French. Great grandson of Jacob and Martha Van Orden. Loos-3rd from left back row. mother was a Winnebago woman. Gattiker; Willus Gattiker. 2nd row: Mrs. Bosshard; Henry Ochsner; Mrs. Anna Hoehn. 3rd row: J.J. Gattiker; Carl Baer; Alfred Gattiker. Mrs. Charles Wild, Ed Luchow. “45 years”. Grant, 2-2002QJ, 1893, family portrait, uncertain it is the Grant family. Grosinske, Martha , 1-1981J1 [L18J1], c. 1904, house on Maple St. Richard S. Lange, Martha (Grosinske) Lange, and mother Eva (Mrs. Albert) Lange. Grotophorst, 24-1996I, chinaware, glassware & table settings once owned by Gertrude Dahlen Grotophorst. Grotophorst, Diederick, 16-2001KB, partner in Conger, Schoephoester & Grotophorst Dept. Store on Main St. in Prairie du Sac. John, Timothy. Front: Dency (Gray), Hannah, Julia, Mary, George. Canada, settled in Whitewater, WI and then North Freedom in 1848. Hackett, Frank, 16-2001IZ, with brothers, Parshall, John, Joel, Timothy, George. 1870. Hackett, George, 16-2001IZ, with brothers, Frank, John, Joel, Timothy, Paschall. 1870.
settled in Whitewater, WI and then North Freedom in 1848. Hackett, Joel, 16-2001IZ, with brothers, Frank, John, Paschall, Timothy, George. 1870. Hackett, John, 16-2001IZ, with brothers, Frank, Paschall, Joel, Timothy, George. 1870. Hackett, Parshall family, UN305. Parshall, Hattie Lampart Hackett (seated, far right). 1st daughterIda and last daughter Clarella are not pictured. Hackett, Parshall, 16-2001IZ, with brothers, Frank, John, Joel, Timothy, George. 1870. Hackett, Timothy, 16-2001IZ, with brothers, Frank, John, Joel, Paschall, George. 1870. Rev. Jones, only guests both mothers. Haines, Clara, 91985 [V-7F], Alice Smith (Mrs. Arthur Farnsworth), Mae Devlin, Susan Smith (Mrs. George Loos), Mable Devlin, Phoebe Hains (Mrs. Jones), Lucy Smith (Mrs. Dexter Russell), Constance King (Mrs. Arthur Hill), Clara Haines. Haines, Phoebe, 91985 [V-7F], Alice Smith (Mrs. Arthur Farnsworth), Mae Devlin, Susan Smith (Mrs. George Loos), Mable Devlin, Phoebe Hains (Mrs. Jones), Lucy Smith (Mrs. Dexter Russell), Constance King (Mrs. Arthur Hill), Clara Haines. Hannes, Phoebe, 12-1985 [V-J7], L-R, Back: ?, Mame Odekirk, Phoebe Hannes, Hattie Norris. Haraszthy, Count Agostin, UN1943, from Hungary, founded Sauk City & later, Calif. wine industry. Haraszthy, Agustin, 2-2004BI, Glass Neg. March 19, 1899 at 22 years of age. Digital copy of px donated by Barb Steinhorst. 9. ?, 10. Mrs. Amelia Risley, 11. Evva Varnell, 12.?, 13. Clara Risley Sinclair. Hatz, Wayne, 2-2006D, on right, at Baraboo Optimist Club with unidentified man on left. Hawkins, N.P., 2-2005AM [A-3, 42], Negative. Hawley, Victoria, UN277, Victoria Wisconsina Peck Wheeler Hawley. Mrs. Nelson W. Wheeler-Hawley, nee Peck. Herfort, Frank, 32-2005, with fish, in Harley Davidson motorcycle, on Baraboo South side. Herfort, Frank, 31-2005, group of men, he is 4th from left, back row. Hewitt, 31-2003C, Hewitt family picnic, place unknown. (b. 1886). c. 1901. “of the South Side”. Robert, Jessie, Sadie. Mrs. Holden died 1916. Hoppe, Julius, 2-2006HY. L-R: Peter Lind, Julius Hoppe - father-in-law, Roy McCoy - brother-in-law.C. Late 1920's, at Hoppe cottage, Summerville Park, Okee, WI. Humphrey, Ira, UN254, came to Baraboo c. 1860. A tinsmith, in hardware business, died 1910. Hurlbut, Oscar A. UN1006, Died Memorial Day 1943 at Gettysburg reunion of Blue & Gray. On right: Henry Alexander. Irish, Mattie, 87-1950 [R10-23BB]. 1. Leila Johnson, 2. Laura Lawson, 3. Mable Johnston, 4.?, 5. Clara Risley, 6. Evva Varnell, 7. Maud Monroe, 8. Olga Reinking, 9. Mattie Irish. Irwin, Mrs. Dr. Irwin, K-32, group: Top row, L-R: Mrs. Van Orden, Mark Warren, Mrs. Dr. Irwin, Miss Gritli Gattiker, Mrs. Mark Warren. Bottom: Charles Wild, Mrs. Emil Pfannstiehl, Mr. Emil Pfannstiehl, Mrs. Charles Wild, Ed Luchow. “45 years”. Jenks, Henry & Eddie, 12-1992A [S75-FA], also with unidentified girl. Johnson, Family, 9-2005AA. James Johnson Family, near Lime Ridge, c. 1890's. L-R: 1. Emmaline (married Mr. Lewis); *2. James (married Nellie Butcher); 3. William “Will”, b. 11-16-1866, d. 2-9-194?, (married Rhoda Hineman, b. 5-13-1877, d. 8-29-1929); 4. Alpha “Aunt Cissy”, b. 9-29-1870, d. 3-29-1934, unmarried; 5. Sherm, b. 1866, d. 1936, (married Mathilda Walker - had no children); 6. Lillie, b. 1875, d. 1918, (married Myron Conklin); 7. Ellen, b. 1857, d. 1902, (married Geo. McBrayer); 8. Mother: Rebecca (Porter) Johnson, b. 1839, d. 3-10-1921; 9. Father: James Johnson, b. 1833, d. 1909; 10. Sarah E. “Betty”, b. 1859, d. 1942, (married Jos. W. Dempsey, 1859-1934); 11. Minerva, b. 1879, d. 1944, (married Otto Bohn). *James & Nellie (#2 above) had 8 children: Josephine, Arlin, Marian (male), Faye (male), Lennie, Alice (incompetent), Gloria, _____? NEG. Johnson, James, 9-2005E, and Nellie Butcher, wedding photo. Johnson, John, 25-1991D [R37CD], GAR member, Co. F, 1st Wis.
Johnson, M.C., 25-1991K [R37CK], GAR member, Co. F, 1st Wis. Cav. Johnston, Leila, 87-1950 [R10-23BB]. 1. Leila Johnson, 2. Laura Lawson, 3. Mable Johnston, 4.?, 5. Johnston, Mable, 87-1950 [R10-23BB]. 1. Leila Johnson, 2. Laura Lawson, 3. Mable Johnston, 4.?, 5. Jones, Dr. Asa Norman, 48-2003B, 1864-1927, b. Jonesville, Adams Co., WI, Aug. 11, 1864.
hospital in partnership with Dr. A. Edwards. Died May 13, 1927, buried in Oxford, WI. Photo donated by Dr. James Pawlsich. 1874, d. 2-28-1919, buried Sauk City or Prairie du Sac; John Eugene, b. 7-16-1869, d.
1891, d. 1940, Mrs. Ralph E. Sutherland. Kellogg, Jud, UN504, farmer, husband of Anna (his 2nd wife). Kelly, Daniel, M., UN516, Dr.
Kent, Alice, UN928, home, up to 1880. 918 Oak St., Baraboo. Later torn down. King, Constance, 91985 [V-7F], Alice Smith (Mrs. Arthur Farnsworth), Mae Devlin, Susan Smith (Mrs. George Loos), Mable Devlin, Phoebe Hains (Mrs. Jones), Lucy Smith (Mrs. Dexter Russell), Constance King (Mrs. Arthur Hill), Clara Haines. Kirk, Bess, 14-1995I44, back: Edna Stoll, Rose Kohlmeyer, Maud Barrett, Celia Meyers, Ferl Talbot, Ruth Cahoon, Grace Conklin, Clarence Bohn, Merl Talbot, Miss Booher (teacher). 2nd Row: Carrie Francois, Arta Risley, Marnenie Pool, Bess Bohn, Winefred Benneth, Bess Kirk, Alta Blackman, Hazel Cahoon. 3rd Row: Hattie McBrier, Edna Powers, Arma Cook, Amy Bohn, Ferne Cahoon, Eva Bohn, Mildred Enech. Klein, Loranz A., 25-1991MB [S53-MB], & Martha (Redman) - 6year old Herbert & baby Vera. Kohlmeyer, Rose, 14-1995I44, back: Edna Stoll, Rose Kohlmeyer, Maud Barrett, Celia Meyers, Ferl Talbot, Ruth Cahoon, Grace Conklin, Clarence Bohn, Merl Talbot, Miss Booher (teacher). 2nd Row: Carrie Francois, Arta Risley, Marnenie Pool, Bess Bohn, Winefred Benneth, Bess Kirk, Alta Blackman, Hazel Cahoon. 3rd Row: Hattie McBrier, Edna Powers, Arma Cook, Amy Bohn, Ferne Cahoon, Eva Bohn, Mildred Enech. LaFallette, Philip, 5-1965A [K7-18BA], with Jake Meyer & Robert M. LaFallette Jr.
Lange, and mother Eva (Mrs. Albert) Lange. Lange, Lillian, maid at Van Orden mansion. Born: Nov. 30, 1893, d. March 26, 1982, age 89. Photo loaned by Mrs. Wm McIntyre, Baraboo, June 2004. Lange, Lillian 2, maid at Van Orden mansion. Born: Nov. 30, 1893, d. March 26, 1982, age 89. Lang. Photo loaned by Mrs. Wm McIntyre, Baraboo, June 2004. Lange, Lillian 3, maid at Van Orden mansion. Born: Nov. 30, 1893, d. March 26, 1982, age 89. Photo loaned by Mrs. Wm McIntyre, Baraboo, June 2004. Closeup of above. age 89. Photo loaned by Mrs. Wm McIntyre, Baraboo, June 2004. Lange, Richard, 2-2005O. Richard is on right. 2 men with bicycles. C. 1884. Lawson, Laura, 87-1950 [R10-23BB]. 1. Leila Johnson, 2. Laura Lawson, 3. Mable Johnston, 4.?, 5. Lee, Charles H. & Son, Robert, UN527, 620 Vine, Baraboo, hardware. Lenihan, Bernard, 16-2001BG, given award at B.O.W. Markert, Waldo, 46-2001S, Waldo, Marvin (served in New Guinea in WWII), Frank. Sons of Mr. & Mrs. Frank Markert. Welby (Mrs. Reuben) 1852-1929; Laura Welby Williams (Mrs. Charles H. Williams Jr.); Charles H. III. (Mrs. Reuben) 1852-1929; Laura Wilby Williams (Mrs. Charles H. Williams Jr.); Charles H. III. Martin, John, 2-2002OB, Fishermen, c. 1900. Also: Harold Berkley, Will Springer, M. Brown. Martin, Laura Pearl, UN543, wife of Charles, d. 1923. Mc Brier, Hattie, 14-1995I44, back: Edna Stoll, Rose Kohlmeyer, Maud Barrett, Celia Meyers, Ferl Talbot, Ruth Cahoon, Grace Conklin, Clarence Bohn, Merl Talbot, Miss Booher (teacher). 2nd Row: Carrie Francois, Arta Risley, Marnenie Pool, Bess Bohn, Winefred Benneth, Bess Kirk, Alta Blackman, Hazel Cahoon. 3rd Row: Hattie McBrier, Edna Powers, Arma Cook, Amy Bohn, Ferne Cahoon, Eva Bohn, Mildred Enech. McCoy, Anna Blatchley, UN542, Mrs. Samuel McCoy, Born c. 1850, a teacher. Died c. 1919. Meyer, Jake, 5-1965A [K7-18BA], with Philip LaFallette & Robert M. LaFallette Jr.
Meyers, Celia, 14-1995I44, back: Edna Stoll, Rose Kohlmeyer, Maud Barrett, Celia Meyers, Ferl Talbot, Ruth Cahoon, Grace Conklin, Clarence Bohn, Merl Talbot, Miss Booher (teacher). 2nd Row: Carrie Francois, Arta Risley, Marnenie Pool, Bess Bohn, Winefred Benneth, Bess Kirk, Alta Blackman, Hazel Cahoon. 3rd Row: Hattie McBrier, Edna Powers, Arma Cook, Amy Bohn, Ferne Cahoon, Eva Bohn, Mildred Enech. Monroe, Maud, 87-1950 [R10-23BB]. 1. Leila Johnson, 2. Laura Lawson, 3. Mable Johnston, 4.?, 5. Montgomery, Carrie, 7-1963O [B3-33O], c. 1906. Gladys Pearson-teacher at Man Mound School. Montgomery, Minnie, 7-1963O [B3-33O], c. 1906. Gladys Pearson-teacher at Man Mound School. Montgomery, William, 7-1963O [B3-33O], c. 1906. Gladys Pearson-teacher at Man Mound School. Moog, George, 25-1991G [R37CG] GAR member, Co. F 23rd Wis. Inf. Moore, Volney, 25-1991A [R37CA], GAR member, Co. F 3rd Wis. Cav. Ness, Albert, 2,2005AT, WWI soldier. Mobalized at Chicago Dec. 28, 1917, embarked for France April 30, 1918. Disembarked at N.Y. & returned Feb. 27, 1919, 8 months 18 days in France. Discharged at Ft. Shuedea?, Ill. July 5, 1919. Enlisted at age 44, claimed to be oldest volunteer from Sauk Co.
Neubauer, Harold, 1-1993B33, 10 years old & Helen, 2 years 10 months. Norris, Hattie, 12-1985 [V-J7], L-R, Back: ?, Mame Odekirk, Phoebe Hannes, Hattie Norris. Noyes, Col. David Knox, UN567, GAR member, 49th Wis. Inf. Noyes, D.K., UN568, home at Ash & 1st. Noyes, David Knox, 25-1991F [R37CF], GAR member, 49th Wis. Inf. Odekirk, Mame, 12-1985 [V-J7], L-R, Back: ?, Mame Odekirk, Phoebe Hannes, Hattie Norris. Olds, Mary, 2-2002QT, Aug. 21, 1924, Aurora, Il., “Patton D. and his great great aunt, Mary Olds. May 1878 - Aug. 1904. Previously he was proprietor of Western Hotel. Pearson, Gladys, 7-1963O [B3-33O], c. 1906. Gladys Pearson-teacher at Man Mound School. Diseases, Jan. 25, 1935. With group of others, none from Sauk Co.
Peck, Mrs. Harve, 12-1985 [V-J7], L-R, Back: ?, Mame Odekirk, Phoebe Hannes, Hattie Norris. Peck, Sarah Ann, UN1022, tombstone, daughter of J.W. & H. Peck who died in 1855. Peck, Victoria, UN277, Victoria Wisconsina Peck Wheeler Hawley. Mrs. Nelson W. Wheeler-Hawley, nee Peck. Pigg, Esther, 12-1985 [V-J7], L-R, Back: ?, Mame Odekirk, Phoebe Hannes, Hattie Norris. Pool, Marnenie, 14-1995I44, back: Edna Stoll, Rose Kohlmeyer, Maud Barrett, Celia Meyers, Ferl Talbot, Ruth Cahoon, Grace Conklin, Clarence Bohn, Merl Talbot, Miss Booher (teacher). 2nd Row: Carrie Francois, Arta Risley, Marnenie Pool, Bess Bohn, Winefred Benneth, Bess Kirk, Alta Blackman, Hazel Cahoon. 3rd Row: Hattie McBrier, Edna Powers, Arma Cook, Amy Bohn, Ferne Cahoon, Eva Bohn, Mildred Enech. Poppe, Elsie, 17-1993H2 [C39H2], Mrs. Dr. A.L. Farnsworth, with husband and daughter. Powers, Edna, 14-1995I44, back: Edna Stoll, Rose Kohlmeyer, Maud Barrett, Celia Meyers, Ferl Talbot, Ruth Cahoon, Grace Conklin, Clarence Bohn, Merl Talbot, Miss Booher (teacher). 2nd Row: Carrie Francois, Arta Risley, Marnenie Pool, Bess Bohn, Winefred Benneth, Bess Kirk, Alta Blackman, Hazel Cahoon. 3rd Row: Hattie McBrier, Edna Powers, Arma Cook, Amy Bohn, Ferne Cahoon, Eva Bohn, Mildred Enech. Premo, Charity, 12-1985 [V-J7], L-R, Back: ?, Mame Odekirk, Phoebe Hannes, Hattie Norris. Premo, Gertie, 12-1985 [V-J7], L-R, Back: ?, Mame Odekirk, Phoebe Hannes, Hattie Norris. Purdy, B.L., UN604, 3rd postmaster in Baraboo, b. Sep. 27, 1816-d. July 19, 1905. Reardon, Frederick, 24-1920K [1225CK] Cheryl Mackie (Little Italy, Flying Tigers etc) has identified the picture as Frederick Patrick Reardon born December 25, 1891 and died October 14, 1918. The picture appears to have been taken around the time of his death. He was Cheryl's grandfather. Redman, Martha, 25-1991MB [S53-MB], & Lorenz A. Klein - 6year old Herbert & baby Vera. Reed, Charlie Lee, 2-2005A, Charles Lee Reed, age 34; Mae Montgomery Reed, age 29; Hubert Stanley Reed, age 5, photo taken 1914. Reinking, Olga, 87-1950 [R10-23BB]. 1. Leila Johnson, 2. Laura Lawson, 3. Mable Johnston, 4.?, 5. Ringling, Ida B., 16-2001GJ, nee Palmer, wife of Henry Ringling Sr.
Risley, Clara, 87-1950 [R10-23BB]. 1. Leila Johnson, 2. Laura Lawson, 3. Mable Johnston, 4.?, 5. Sarahan, Hugh A., 24-1920CGG [1225CGG], WWI soldier, Apr. 2, 1918-Jan. 8, 1919, to Ft. Stevens, C.A.C. Schneller Family, 102-2006-9. “Peter & Margaret Schneller Family at Witwen Campground, c. 1915. Peter was wounded at Gettysburg. Schneller, Verna, 102-2006-4. Verna Schneller’s funeral flowers, died of polio at age 8. Vincent & Bertha Schneller’s daughter. Sep. 6, 1910. Schneller, Hoppe, 102-2006-2. Irene Schneller & Phyllis Hoppe, 8th grade graduation from Harrisburg School, Troy Twp. held in Reedsburg. 1949. Schneller, Dwayne, Irene, 102-2006-3. Kids. 1936. Schneller, Verna, 102-2006-8. Pre 1910. Schultz, Walter Denzer, Christ Hanusa, Charles Wolfe, Joe ?, Bob ?. Early 1900's. at 1015 West St., Baraboo. Searles, Charles, UN726, Civil War, Co. G. 1st Wis.
Skrable, Burman & Trudy, 16-2001OA, 1992, Sif Roll’s daughter, 50th Anniv., Whitefish, Mont. Skrable, Trudy & Burman, 16-2001OA, 1992, Sif Roll’s daughter, 50th Anniv., Whitefish, Mont. (Mrs. Arthur Hill), Clara Haines. Smith, Lucy, 12-1985 [V-J7], L-R, Back: ?, Mame Odekirk, Phoebe Hannes, Hattie Norris. Spencer, Mike, 2-2006CB, March 7, 2003, Bill Schuette Neg. Springer, Will, 2-2002OB, Fishermen, c. 1900. Also: John Martin, Harold Berkley, M. Brown. Stanley, Samuel Austin, 24-1920CJ, WWI Soldier, Oct. 13, 1917 - Oct. 19, 1918, Camp Green, N.C.
present Baraboo Country Club – barn was on site of clubhouse). Former Paddock farm. wife of Eugene English- parents of John Wright- uncle of Ann Waugang? Sullivan, Capt., UN1002, Civil War, 9th Wis.
Toole, UN1912, “Overwash plain in front of Astle & Hill’s near Toole’s. Taken from point where carriage stopped under tree, after driving through first kettle. Tousley, N.R., 25-1991J [R37CJ], GAR member, Co. D, 16th Wis. Inf. Trimpey, [loaned], Baraboo photographer, Edward Trimpey. Loaned to copy by Betty Krueger. Reese, Anne Elizabeth, photo loaned from Reese Home. Unknown, 393-2004, Group of men in front of unknown building. “A Happy Birthday to Harry from Grace L. Powell, 8/23/36"
lumberyard on corner Broadway & Birch. Van Orden, Jacob, 112-2006C&D, golfing. L-R: ?, John Malone, Judge Evan A. Evans, Jacob Van Orden. Van Orden, Family, 112-2006B, “Madame” Jane Van Orden, Mary Louise Van Orden French, & her first baby, William. The baby’s mother, grandfather and great grandmother. Van Orden, Porch, 112-2006J, Jane & Jacob on porch with friends at their home, 531 4th Ave., Baraboo. Van Orden, Schyler. Photo. Ca. 1940. Reinking, 9. ?, 10. Mrs. Amelia Risley, 11. Evva Varnell, 12.?, 13. 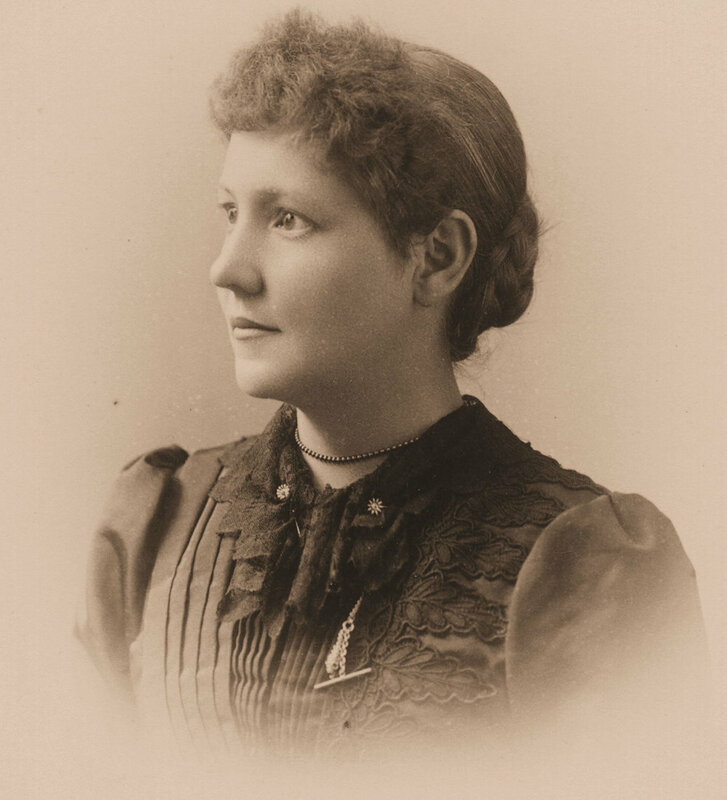 Clara Risley Sinclair. Varnell, Evva, 87-1950 [R10-23BB]. 1. Leila Johnson, 2. Laura Lawson, 3. Mable Johnston, 4.?, 5. Werron, Phillipena, UN968, & Wm Stackhouse, Sr.
Westurn, Wm, 2-2002EB, with John. Wm is on right. Westhmuller, Miss. N., 16-2001DZ, niece of Carl Schutz? Wheeler, Victoria, UN277, Victoria Wisconsina Peck Wheeler Hawley. Mrs. Nelson W. Wheeler-Hawley, nee Peck. (Mrs. Reuben) 1852-1929; Laura Welby Williams (Mrs. Charles H. Williams Jr.); Charles H. III. Willson, 2-2002PW, Rev. J.M., D.D., photo taken New York, N.Y.
Winch, George D., UN734, Civil War surgeon, 42nd Reg. Inf. Woock, Mabel, 16-2001EX, Mabel Woock & Amanda Fisher? mother was a Winnebago woman. Mrs. Gardner. Workers, 2-2004KN, Large group of men and a cook. Unidentified.